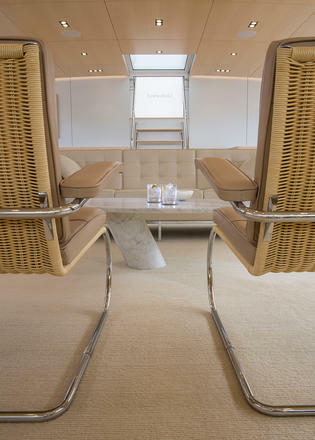 The interiors on Unfurled were designed by Stirling & Co.
From her clean lines to her Bauhaus-inspired interior and race-winning technical innovations, 2016 World Superyacht Awards winner Unfurled has a cerebral approach to both style and speed. 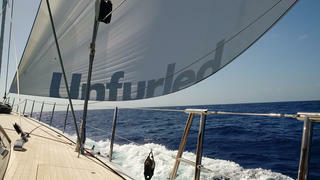 The owners of Unfurled did not need to build a new boat. Their existing 34 metre Germán Frers designed yacht was launched in 1999 and still served them well, whether cruising or racing in superyacht regattas. Captain Adam Bateman and chief engineer Will Ferris had been with them for more than six years. 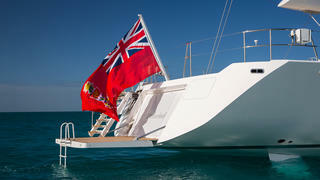 It was their seventh Unfurled, the design was well reasoned and the boat was well maintained. 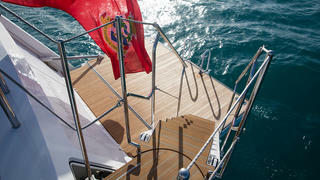 Yet the owners had seen things on other boats that interested them, so they talked to Frers about a new cruiser-racer. Rather than design a boat to handicap or rating rules, he had “a few new ideas” he wanted to try out. Now that the new Unfurled sits in the water, with two regatta successes under her belt, the new ideas have proven pretty effective. Unfurled flies in the face of much current thinking. And, better than that, she really flies. The brief for Unfurled began with a request for a proper sailing yacht that could perform well on all points of sail, be well-balanced, fun to drive and have a kindly motion. 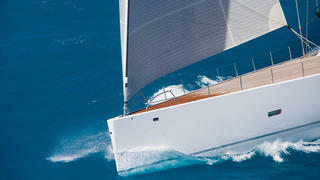 They expected speed or, as Frers humbly puts it, “the occasional exhilarating racing experience”. Bucking the belief that light displacement is the path to a podium finish, Unfurled is 300 tonnes fully loaded and races at about 275 tonnes. 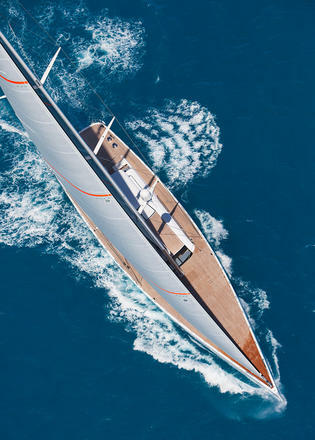 Frers created a low-drag, maximum waterline shape for the generous canoe underbody that flattens only well aft. 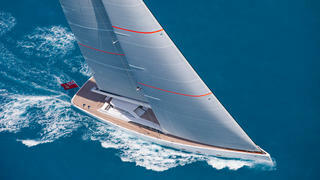 It has a telescopic keel for maximum upwind speed, with harbour draught and twin rudders for optimal control. 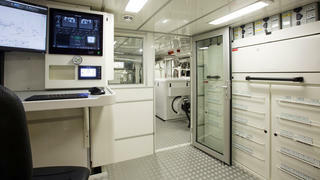 The enormous beam gives space for a huge open-deck saloon under a hardtop, a multifunctional lower saloon, a knockout galley, stowage for a Williams jet tender under the foredeck, a separate laundry, four cabins for seven crew, an air-conditioned engineer’s control room and an engine room with 1.8 metres of headroom. You can say that about a lot of features on Unfurled, from her square-top mainsail to her retractable propulsion, twin submarine anchors, a below deck winch pit, pop-up bollards and a new rudder feedback system. The twin carbon fibre rudders, made at Vitters’ UK subsidiary Green Marine, were, until 86 metre Aquijo’s launch this year, the world’s largest and create significantly more control when the yacht is heeled. 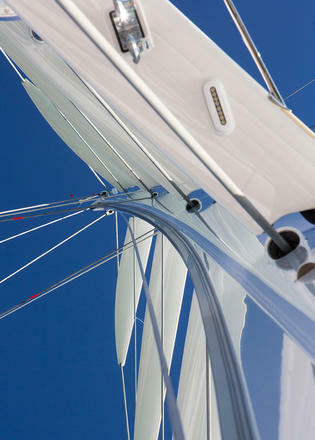 Although Vitters has been at the forefront of steering developments for sailing yachts, Barrett pushed this further with Unfurled. He used a different idea, measuring pressure on the rudders to control hydraulically assisted variable power steering, allowing a light touch on the wheel. 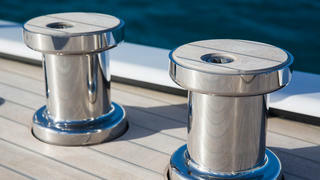 The system gives the helmsman plenty of feedback yet is just four turns of the wheel lock to lock. The owners are New Yorkers, well established in the arts and culture scene. 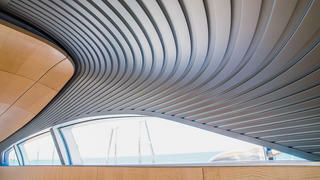 Their taste is modern and spare, but there’s a whole lot going on in the designs of their boats. Unfurled follows the early 20th century Bauhaus principles: the unity of all arts to turn out useful and beautiful objects with visual clarity as well as an emphasis on the social function of architecture. It is clean and cerebral. “Our goal was the distillation of our past design ideas, applied to the interior and exterior of the new Unfurled,” says the owner. 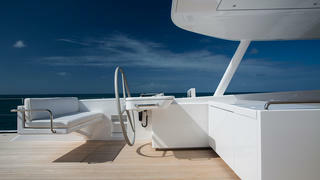 It starts with the smooth exterior lines and the flush deck. Her looks, with flat sheer, high freeboard and low house, are deceptive – at a distance you might guess Unfurled to be five metres shorter, stand alongside and you might think she’s five metres longer. The yard used retractable bollards and captive winches to allow the storage of equipment — as well as a six metre jet tender and crane — below deck while preserving accessibility. But that’s not the only trick in Unfurled’s deck. It is uniquely without a king plank – this usually runs along the centreline of a deck and the other, gently curved planks fit into it. Instead, every deck plank on Unfurled is straight, fore to aft, and outlined with pale gray caulk. The teak edge disappears under a recess in the flat toe rail and every flush hatch is custom sized to line up with the planks. The effect is mesmerising in its simplicity. On the previous Unfurled the owners learned they wanted a place to escape the sun and entertain on deck – and they didn’t want canvas on a frame. 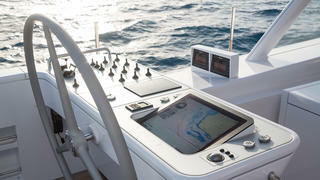 Frers drew them a streamlined superstructure enclosed on three sides, until you push a button or two. Large windows open to port and starboard, while a trio of forward-facing hatches in the coachroof, invisible when closed, act like wind scoops but without disrupting the profile. Both the deck lounge on Unfurled and the cockpit proper are symmetrical. Large U-shaped all-weather sofas sit on polished stainless legs looking very Le Corbusier and complementing sleek steering pedestals near by. These were milled from single blocks of aluminium so there are no welds, no screws, and no moving parts to squeak. Not only are the owners of Unfurled experienced sailors, they are designers as well, he with a successful record in high-end residential property development. Their last boat had been a trendsetter with a modern, pale interior that stood out from the period recreations and gloss-finished dark woods dominating the scene. Oliver Stirling, who worked on the design of the previous Unfurled while at Winch Design and now has his own firm, helped the owners detail the plan and guided the interior outfitters for the new boat. 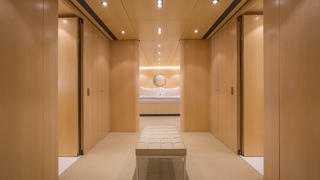 “The owners have an uncompromising conviction in the power and utility of modern design,” says Stirling. He calls it “objective perfectionism”. The saloon on Unfurled is dominated by aluminium and windows — because of the flat sheer, you can see forward all the way to the horizon. Louvred panels with a silver anodised finish frame portholes, windows and the windscreen. The entire aft bulkhead is satin-finished aluminium and cabinets along the cabin side seem to float off the floor on aluminium grills. This pale grey complements the soft tones of the satin-finished sycamore joinery and 5mm planked floor, as well as mimicking the grey caulking of the deck and honouring the structure of the yacht itself. 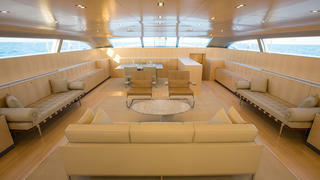 The seating area is centred on a white carpet from Nepal with an ultra-modern ovoid marble table. Overhead are 38 sycamore panels, each carefully plotted on computer to match the overhead space. There are no knobs or handles; in fact a magnetic card is required to open the linen closet in the hall leading to the guest cabins. 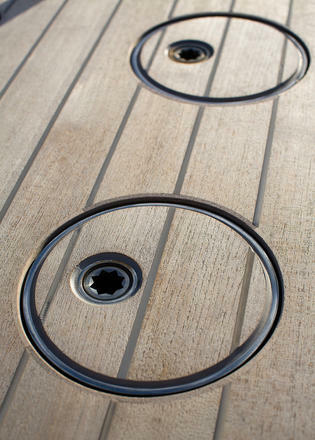 Everything is aligned to lead the eye where it is supposed to go; doors float on offset pivot hinges and doorstops disappear as easily as the bollards on deck. It is the unity of art and craft — very Bauhaus. Two lower deck guest cabins flank the hall and continue the décor of the saloon. In the twin cabin, the beds and nightstands can be unpinned from the walls and shifted to create a king-size bed — in a cabin nearly equal to the VIP opposite. “We didn’t want to compromise space, rather we wanted to use it generously,” says the owner. 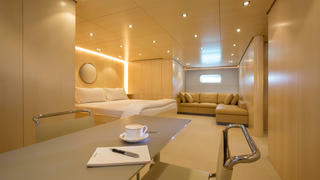 In fact, the new 46 metre Unfurled has the same number of cabins as her 34 metre predecessor. The master is the showstopper. Double doors open on to a spacious foyer that doubles covertly as a dressing room. Flanking the space are his and hers en suites trimmed in white Thassos marble. 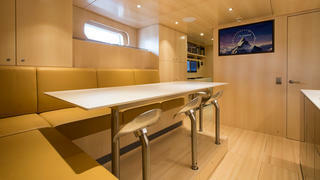 Aft, the cabin showcases Unfurled’s beam — as well as a Lichtenstein above the bed. 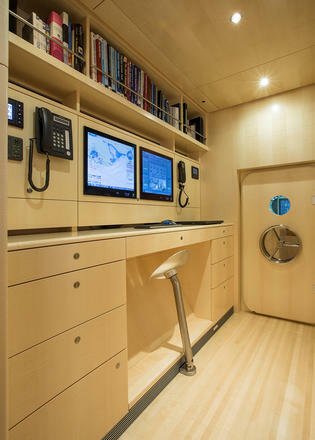 A fixed aluminium table to starboard is paired with two chairs, while a fax machine and a printer are hidden away in the wall. Another design standout on Unfurled is the dayhead. “The owner calls it the oval office,” says Bateman. It is down a few steps from the saloon and a perfect oval neatly tucked between corridor and mast trunk. 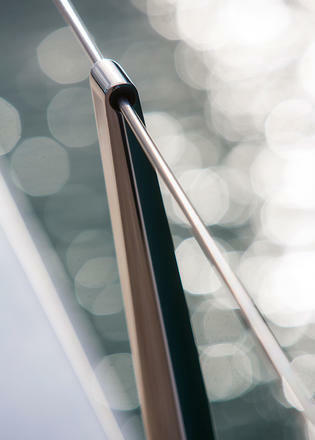 Everything forward of the mast is the domain of the crew, and finished in the same light tones and aluminium. The galley, designed by the owner himself, is a masterpiece, with a layout that separates the hot zone from prep and service areas, while cabinets are fitted into every possible space. The mess is large enough for all of Unfurled’s crew to gather at once and the support pole under each seat is on a spring hinge anchored to the floor (so that no time is wasted tying stools to the table when the boat sails). Walter Gropius would approve. Barrett and Vitters gave Unfurled the biggest engine room of any boat in its class — possible because of the single level saloon. It, too, is a feat of organisation. The main engines and gensets — in sound boxes — are clustered in the centre and all have power take-off for running hydraulics. 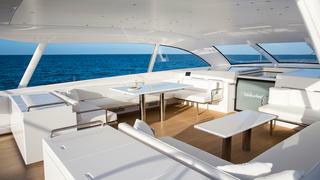 The main engines power the retractable drive legs by Hydrosta with forward-facing propellers that can rotate 360 degrees. These are located just aft of the keel (and not under any cabins) to allow Unfurled to spin on its axis — and when sailing they retract fully into the boat, presenting far less drag than feathering props.